For a brief moment on December 27, 2007, life came to a standstill in Pakistan. Benazir Bhutto, the country’s former prime minister and the first woman ever to lead a Muslim country, had been assassinated at a political rally just outside Islamabad. Back in Karachi—Bhutto’s birthplace and Pakistan’s other great metropolis—Rafia Zakaria’s family was suffering through a crisis of its own: her Uncle Sohail, the man who had brought shame upon the family, was near death. In that moment these twin catastrophes—one political and public, the other secret and intensely personal—briefly converged. Zakaria uses that moment to begin her intimate exploration of the country of her birth. Her Muslim-Indian family immigrated to Pakistan from Bombay in 1962, escaping the precarious state in which the Muslim population in India found itself following the Partition. For them, Pakistan represented enormous promise. And for some time, Zakaria’s family prospered and the city prospered. But in the 1980s, Pakistan’s military dictators began an Islamization campaign designed to legitimate their rule—a campaign that particularly affected women’s freedom and safety. The political became personal when her aunt Amina’s husband, Sohail, did the unthinkable and took a second wife, a humiliating and painful betrayal of kin and custom that shook the foundation of Zakaria’s family but was permitted under the country’s new laws. The young Rafia grows up in the shadow of Amina’s shame and fury, while the world outside her home turns ever more chaotic and violent as the opportunities available to post-Partition immigrants are dramatically curtailed and terrorism sows its seeds in Karachi. 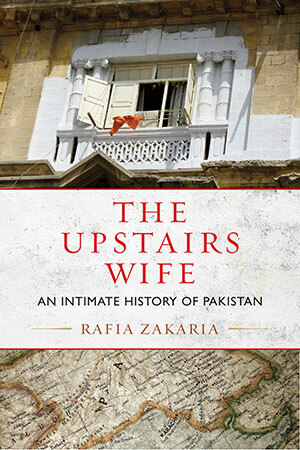 Telling the parallel stories of Amina’s polygamous marriage and Pakistan’s hopes and betrayals, The Upstairs Wife is an intimate exploration of the disjunction between exalted dreams and complicated realities. "The Upstairs Wife” does manage to cover so much ground so skillfully, casting a sharp eye on complicated personal politics and affairs of state alike." From Chapter 1: "The Return"
As we entered this Karachi the easy, smiling contours of my mother’s face pulled tight and then even tighter. She had fought for this, learning to drive just so she could take us to school, to the best schools, insisting that it could be done and that she could do it. For this she had sat awkwardly between my father and my grandfather, arguing her case against their objections. For this she had tolerated our crying chorus, every Monday and Wednesday, when the instructor from the driving school showed up at the door at 9:00 a.m. sharp. For this, she had tolerated the weeks and months of my grandfather Said, insisting that he, who could not himself drive, must nevertheless accompany her on every trip, because a woman, even one with a driver’s license, could not be trusted to drive alone. Her battle to be permitted to drive had not been an easy one. Five years had passed and now she was allowed to drive alone and without my father or grandfather correcting the timing of her turns, the certainty of her navigation. But despite her victory, the descent into this other Karachi, the sweaty, angry, male Karachi, was still my mother’s daily test. My mother did not respond when the light turned green, or at the next light, or as we descended even deeper into the city, onto roads flagged by beggars and hawkers and aimless men hanging around corners. She was quiet as we drove past the row of cinemas, the Capri, the Nishat, the Regal, the Star, past the bloody face of Sylvester Stallone, the jutting hips of a Punjabi actress stilled in midgyration. We passed the electronics market with its unlit neon signs (Hitachi, Sanyo, Toshiba) exposing their wiry entrails.